Growing up in India Mo’s first prominent exposure to noodles was of course instant Maggie noodles. Maggie noodles will always be THE retro symbol for the 80’s child of India, especially if you studied in a boarding school. Later on we were introduced to the standard Indian-Chinese noodles with various names like Hakka noodles, Hunan noodles, Singapore noodles, Sichuan noodles, Teriyaki noodles and off course chowmein. But in all honesty, they all tasted the same and more or less still do. So little did mo know what noodles were really about till she had a mini noodle revelation during her college years at a modern pan-Asian restaurant in London called wagamama (http://www.wagamama.com). There were different noodles that did not just have diverse names but tasted different too! There were Ramen noodles which is the Japanese version of Chinese egg noodles. Then there is rice vermicelli which is the thin, slippery and translucent noodles. Udon noodles are typically Japanese wheat flour noodles of different shapes and thickness. 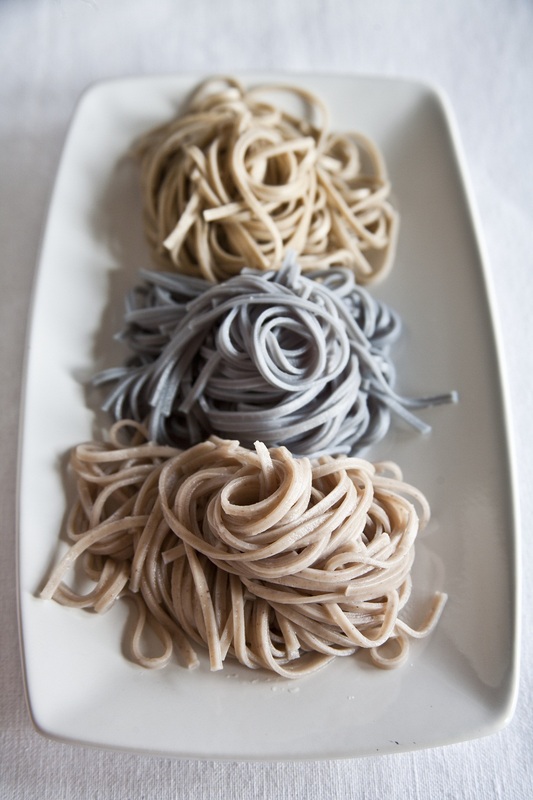 Mo’s favorite Japanese soba noodles made out of buckwheat. Then there is Hokkien noodles which are thick yellow noodles generic to Asian cuisine. The list goes on, but noodles are rather varied and like pasta come in various shapes and sizes. Whether it was first invented in China, Italy or the Middle East is an ongoing debate but most people believe noodles were first invented in china, discovered by Arab merchants around the 4th century who later took it to Italy where they customized the stringy pasta to their palate. One of Mo’s favorite things to make and eat is a large bowl of noodle soup. Just add a good stock to your preferred noodles and whatever veggies and/or meats/seafood lying around and bob’s your uncle. Hot, speedy and hearty. So slurping noodles as a adolescent is fun but slurping noodles as an adult just gets better, especially from a steaming hot bowl of noodle soup with various goodies all staring at your pout waiting to be slurped in the next bite.